In this second part of the page on how to start a neighborhood association, we will help you with inviting neighbors to participate, planning and executing the first few meetings, and finding help when you feel overwhelmed. Now that you have estimated whether this is an easy project or a difficult project, take a hard look in the mirror and see if you have what it takes to begin this organization by yourself. If you have done something similar before, and have confidence you can do it again, by all means, just start. If not, better find some helpers. Strategize about whether you are initiating a brief campaign or a permanent organization. The longer the projected life of neighborhood associations, the more effort you want to devote to building potential supporters into a committee that will make the first invitation. Make it widely representative of the types of people you would like to see involved. If you are threatened with a bad development now and will need to plan how to fight city hall in the next month or so, it's better to risk being perceived as egotistical to get the ball rolling quickly. To invite people to the first meeting as you start a neighborhood association, make some flyers, knock on the doors, or put out the phone calls. State your best case first. Answer the question what is the most urgent problem. Exclude things over which people may feel completely powerless, such as a plant closure. If you have the budget, obviously you could do a mailer to each home. This may be the most realistic strategy in rural areas. Keep the problem statement simple; a list of 25 issues doesn't attract as many people to neighborhood associations as a list of three issues that seem the most widespread and obvious in their effects. Stay away from extremely subtle issues that only a few people would recognize. There will be enough time for nuances later. If people are generally not acquainted with each other and you expect a small turnout for the first meeting, going around the room to invite everyone to respond to an ice breaker question is appropriate. This question might be "How did you come to live in this neighborhood?" or "If you could wave a magic wand and change one thing about the neighborhood, what would it be?" In neighborhood associations envisioned as short term and single issue-driven, the get acquainted question is to ask people how they feel about or heard about the issue. For the first meeting and every subsequent meeting, try to have an ideal outcome of the meeting in mind. Whether or not you share this outcome with the group depends on whether it is likely to be controversial and how the politicians and powerful institutions affecting your neighborhood feel about the issue. A meeting outcome for neighborhood associations can be decision-making or a process outcome. For example, if you have a process outcome, such as "Everyone will feel they have an opportunity to speak about the crime problem if they want to," you can share that with the group at the beginning of the meeting. At the first meeting, be sure to discuss how others perceive the first issue. Give people who differ time to express themselves. Secondly, discuss whether a permanent or temporary group seems most appropriate. 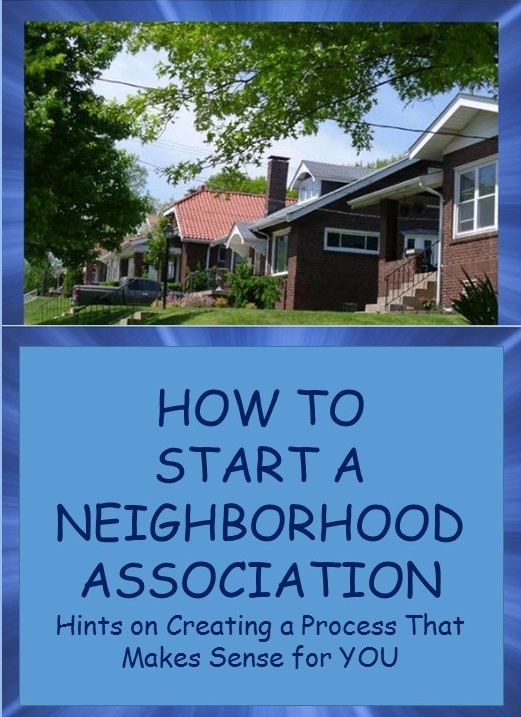 By the way, our new ebook on starting a neighborhood association contains not only parts of several articles from the website, but also brand new materials including examples of bylaws, agendas, and budgets, as well as material regarding temporary versus permanent associations not available anywhere on our site. Click the photo link beside this for more information. After your first meeting to start a neighborhood association, now what? The second meeting typically has one of two results: (1) if your first meeting was underpublicized but the cause is popular, you will have a good percentage increase in attendance, or (2) if you saturated the area with news of your first meeting, and you had a great attendance, the second meeting will reflect how worthwhile people felt the first meeting had been. We should admit that if your first meeting was terrible, your plan to start a neighborhood association might not work after all. Or perhaps you just need to review our advice and make a second try. This "second meeting" picture is likely to carry over from meeting to meeting for the first several meetings. Attendance will be steady and stable only when the cause is "right-sized" in terms of being slightly challenging but not overwhelming, and/or when the socializing becomes pleasant enough that people come just to interact with neighbors. 1. Food and drink certainly help attract a crowd. 2. Keep the meeting a reasonable length, not more than an hour and a half. 3. To deal with a few people dominating the meeting, rely on the group. When the person with a lot to say comes up for a breath, the leader can say quickly, "And what do the rest of you think?" If this doesn't work, you'll have to impose time limits on each speaker. If you are brand new to leading organizations, you may want to read about conducting meetings in general. There's no need to go overboard on Robert's Rules of Order and parliamentary maneuvering, but find your group's comfort level with formality or informality, and then help the group stick to the decisions it makes. As you move past the first meeting or two, you should learn about neighborhood associations in general. If you are a novice in the world of non-profits, you may want to read about how to start a nonprofit in general. You might even be reassured about the many resources available to you by reading our page on nonprofit board development. Lastly you need to start becoming a subject matter expert on your first problem, unless you have a professional in urban or town issues in your midst who can help fill the knowledge void. Sometimes neighborhood dynamics feels more like voodoo than an art or a science. But we can assure you that someone somewhere has invented a successful approach to your issues--even if it is a work-intensive approach. 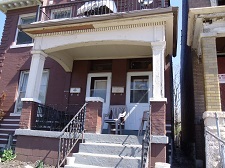 You could return to the first part of this page by clicking on the 1 button below, continue to part 3 on how to structure the new organization, or check out the topic-related pages below, especially the general one on neighborhood associations (last photo link below).